Hunting snow geese isn’t always easy. Spring time hunting means that every single bird you see is smart enough to have survived all the perils that the winter threw their way and are now headed back north. The birds will be wary and often a little skittish. The earlier in the spring snow goose hunting season, the harder it tends to be at decoying the adult snow geese until younger birds arrive. Since you’ve gone to the trouble and expense of traveling to Missouri for the spring snow goose hunting season, you’ll want to make sure you get your fair share of geese, and preferably more than a few. The best way to make sure that happens will be taking advantage of a professional snow goose hunting guide. The more experienced your guide, the happier you’re going to be with the final results. Some people aren’t fans of the idea of goose hunting with the assistance of a guide, they think it will be too expensive, but others agree that it’s the best way. Many people even gather up a group of their friends, make a longer outing of the hunting trip and help reduce the overall cost. Going with a group of people and hiring a Missouri goose hunting guide will actually save you money and time. 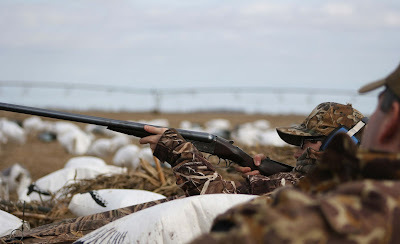 Not only will your friends help lower the travel costs, and the price of guide, but the guide service will supply most if not all necessary equipment, including decoys as well as scouting and everyone knows that two of the most important keys to a successful spring snow goose hunting trip is always having enough decoys and scouting. The guide you hire will supply decoys and have a much better idea about how and where the spread should look on water or in the field so the snow geese will think they’re a real feeding flock and decoy readily. Dogs can be another helpful tool. Missouri has many lakes and ponds some of which are very deep. The spring thaw also means their very cold. As a hunter, you don’t want to have to climb in and out of the water each time you get a goose. By going with a group of people you may have a few of them that have experienced dogs and won’t mind bringing one, you’ll be able to stay warm and dry while the dog does all the retrieving. Most Missouri hunting guides will even have dogs, if your group does not so you can experience the pleasure of working with a truly seasoned hunting animal. No hunting guide will ever promise that you're going to get a lot of birds when you hire their services for your snow goose hunting trip in Missouri, but having a professional guide along does increase you're odds a lot. They study the area and the patterns of the snow geese year in and year out. A good guide will be able to take you to a spot where they think the birds will likely be on that particular day. The guides do a lot of scouting and are seldom wrong but anything can happen while hunting snow geese. Snow Goose Hunting in Missouri!